Grandmother's Flower Garden Binding problem/question??? Thread: Grandmother's Flower Garden Binding problem/question??? Hi everyone! I need help and advice. A friend sent me this beautifully HAND-PIECED GFG top 3 years ago. I have finally finished hand quilting it and am now ready for the binding but....two sides are straight and I have no problem with that but two sides are hexi edges and I am at a loss at how to get binding on them. See attached picture. I am thinking I will need to do a bias binding for the two pointy edges. I have never done this before. Is it hard and do you think the fabric cut on bias will stretch enough to fit the peaks and valleys? Will I have to make tucks like I do when going around a corner on a regular quilt. I have put so much time into this not to mention the time friend put in on hand piecing this whole thing that I don't want to mess up at the end. I had thought of just making a straight edge all around but that seems to be the chicken way out. Open for any and all suggestions. She who dies with the most fabric, didn't sew fast enough! What a job done so far by both of you, I know b ecause I have had one in the works for years. I only work on it occassionaly. 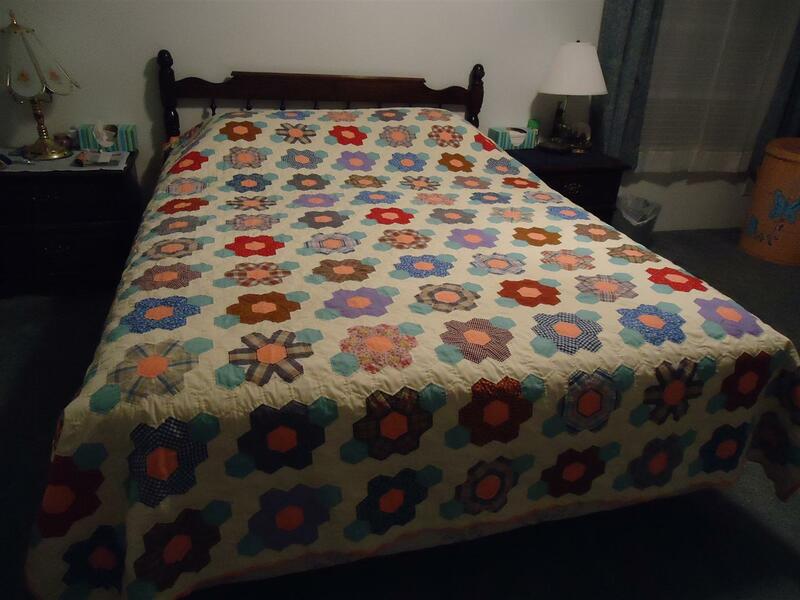 I have a vintage one made by my grandmother in the early '40's and she just turned in 1/4" on the top and the back and slipstitched it together hexes all around. I am just wondering how you got a stright edge on two sides? Yes to the bias binding, and you will need to do ALL sides in bias. Remember to not pull on the binding as you're sewing, otherwise you'll get puckers. Here are some tutes that should help. Or, you could just cut the other 2 edges straight and bind them all with straight binding. I would use facing rather than binding. 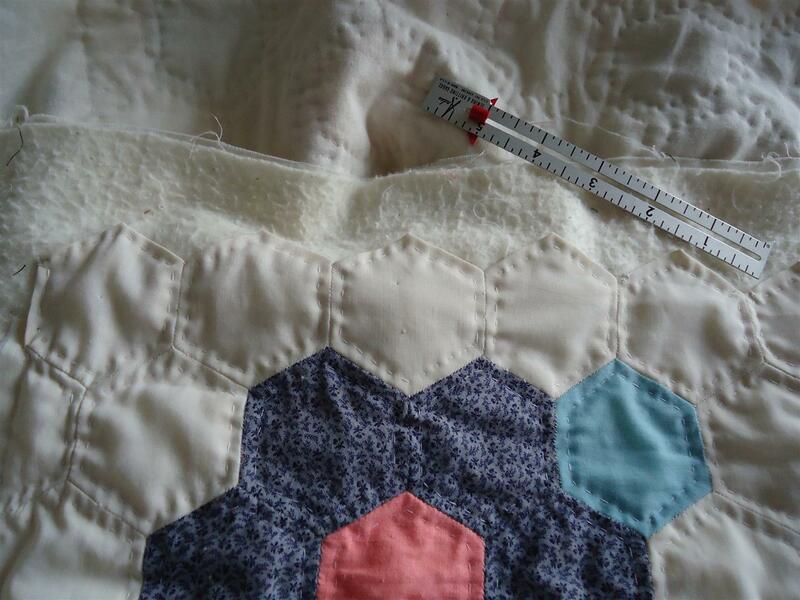 That preserves the beautiful shape of the hexies and it's much easier than binding all around the corners. What a job done so far by both of you, I know b ecause I have had one in the works for years. I only work on it occassionaly. 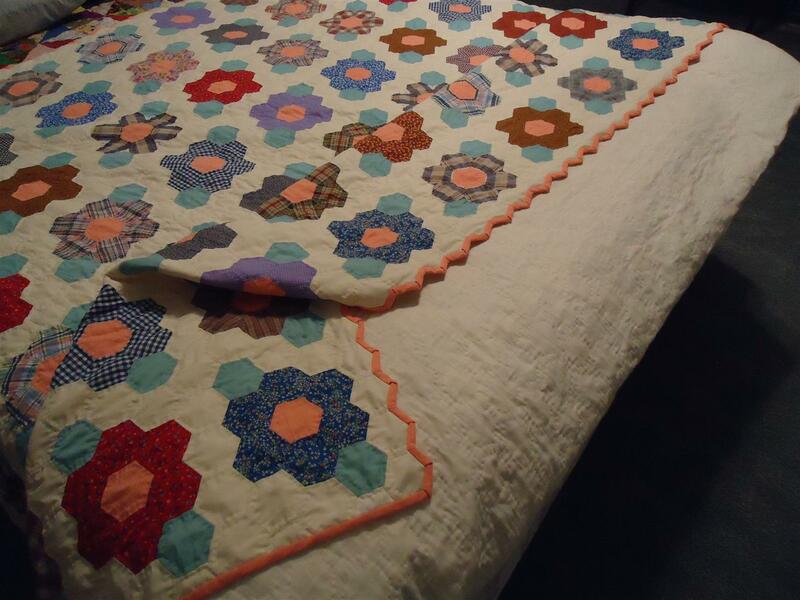 I have a vintage one made by my grandmother in the early '40's and she just turned in 1/4" on the top and the back and slipstitched it together hexes all around. I am just wondering how you got a straight edge on two sides? I did not make the top so would have done it differently but she made two sides straight by cutting half hexies on two opposite sides and filling in the spaces with them and the opposite two ends are the peaks and valleys way. You can see a little bit of the straight side in the upper left corner of picture. Pegg and others...thanks so much for all the tips. I checked out the facing one and although I might use it someday for another quilt, I really think this one 'needs' the binding edge for contrast. It was great seeing that little snip and knowing that makes all the difference. Now I just have to practice cutting bias binding strips on a scrap piece of fabric first before I get into the real thing. Thanks everyone! Now I just have to practice cutting bias binding strips on a scrap piece of fabric first before I get into the real thing. The cutting part is easy. It's the sewing part that will require patience! If you've never done anything but straight binding, I strongly encourage making a small practice quilt using scraps, same size hexies, and practicing on it before you start on the real quilt. Just an update! On July 27th at 9p.m., I finished the last stitch of getting the binding on. Then rushed it down to the quilt display section (not the ones for judging) of our fair where it now is. When I pick it up on Sat., I will sew on the label and as per agreement with gal who hand-pieced the top, it will go off to be offered for sale. Just wanted to share pics and say thanks for all the help of getting the zig-zag bias binding on. Also, wanted to correct my first post and say that I received the top etc. Feb. 2011 and so has taken only a little over 2 years for me to get it all hand quilted. you did a beatiful job on the binding. I didn't do mine that way. I took the lazy way out and put 1/2 hex's all the way around since it was a gift to my daughter. Beautiful job. Beautiful job with the binding! I almost have the top done of mine and plan on hand quilting this winter. Just a quick question, were the papers still in on the outside hexagons? 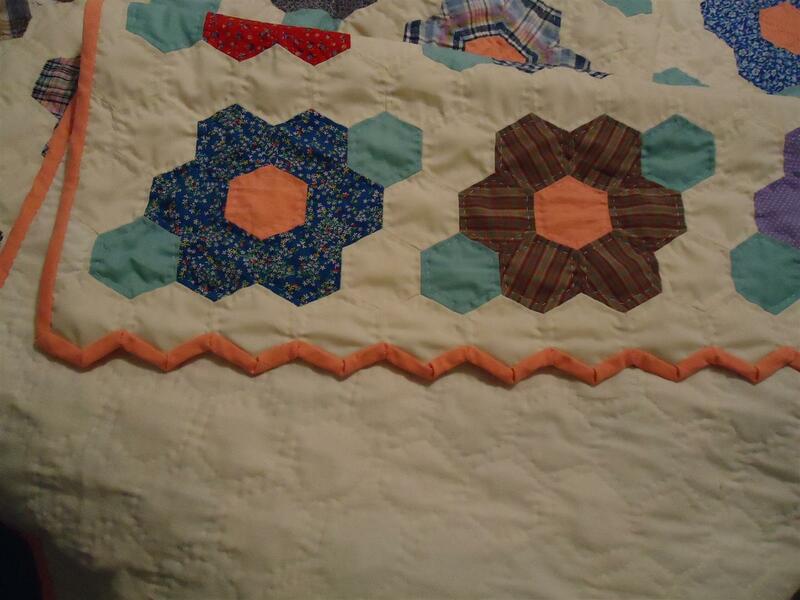 I haven't removed them on mine because I wasn't sure if it would mess something up while quilting the center. And how hard was the bias binding to do? I don't really want to face mine either and am planning on doing a bias binding. It's not a mistake, it's an unconscious decision to change the pattern. There were no papers on any of the hexi's. The bias binding was not so bad cutting out and making but going around the peaks and valleys took some doing. Fortuantely, the hints given at first of this post helped me a whole lot. You have to stay stitch around the entire quilt and then take little snips if you have an edge like this one with peaks and valleys. I used lots of pins when I was making the little tucks. The 'valleys' had to be sewn on both sides so they would stay in place. I also love the salmonie/peachie color binding! Wow! You did a great job! I love the orange color binding. It makes the quilt pop.